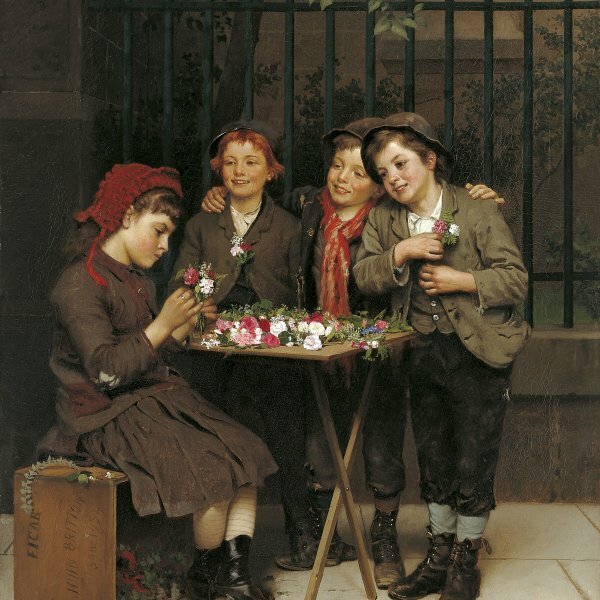 The mixture of sentimental subject matter and high finish of Brown's small genre scenes of city urchins reflected his conviction that beauty was morally persuasive. "A picture can and should teach", he wrote, "can and should exert a moral influence." He took his subjects from the streets of New York, but he cleaned their faces, idealized their forms and arranged them in narrative tableaux that he painted as a polished surface. The popularity of these images points both to the moral status of "finish" in American painting in the 1860s and to contemporary attitudes toward poverty. At a time when the immigrant children who crowded city slums and supplied cheap labour for factories were regarded with as much suspicion as sympathy, Brown's idealised realism appealed enormously to American middle-class audiences. Although previously unrecorded, The Bully of the Neighbourhood is typical of the anecdotal titles Brown gave his work. The children's varied ethnic types and the compressed foreground space where they line up to confront the bully are also motifs that reappear throughout his oeuvre. This format reflected early Victorian historical genre scenes, particularly the work and teaching method of Brown's drawing instructor at the Edinburgh Trustees' Academy, Robert Scott Lauder, who place antique casts on casters for easy moving and grouping. It may also reflect the contemporary theatre. During the late 1850s and 1860s, lowlife "story paper" dramas were among the hits of the New York stage. With titles like Bertha, the Sewing Machine Girl these plays featured idealised lower-class heroes, occasionally children, speaking high-flown language. The Bully of the Neighbourhood looks life a stage set, with a shallow proscenium, painted backdrop and front lighting. The children function as actors playing stock characters. The theatrical quality of Brown's art is telling, because during the 1860s several critics believed that drama most truly represented the "mixed materialistic and imaginative spirit" of the USA. 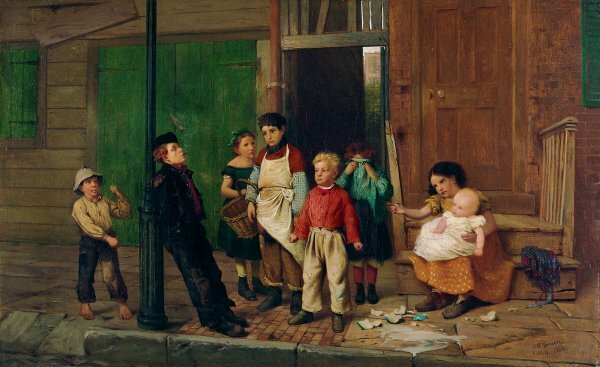 The December 1860 Cosmopolitan Art Journal bemoaned American painters' comparative lack of attention to native subject matter: "We have a certain class of subjects which are peculiar to American cities and shores-newsboys, street-sweepers, wood sawyers, immigrants, dock loafers. But singular as it may appear, few of our respectable artists have chosen this field for subjects of study. Brown turned from portraiture to painting urban children at this time and came to be regarded as one of the first to realise "the artistic possibilities of genre and lowlife in America."